A survey has indicated that fast food giant McDonald’s has the highest visibility level on social media platforms such as Instagram and Twitter. The fast food giant is thus even more visible on the two social media platforms than Apple, Google, Coca-Cola and Nike. On average the logo of the Oak Brook, Illinois-based food chain is featured in close to 890,000 posts on Instagram and Twitter each month. This is according to online statics and market research firm, Statista. Per the researchers the popularity of McDonald’s logo was associated with a high number of food-related photos posted on the social media sites. “Probably thanks to the 21st century need of taking pictures of our food, McDonald’s is the surprise winner in this category,” wrote a data journalist at Statista, Felix Richter, in an online posting. Nike emerged as the second-most visible brand on social media platforms with the sports goods firm being feature in posts totaling 788,490 per month. Adidas, Nike’s rival, was in the third position as it was featured in an average of 772,520 posts per month. The fact that two sports goods firms took two positions among the top three most visible brands on social media was attributed to the popularity of athletes’ posts as well as fitness selfies. In the fourth and fifth positions were Coca-Cola and Emirates Airline respectively. Though they featured in the rankings technology brands such as Amazon, Apple and Google did not perform as well as would have been expected. None of the above-mentioned brands were featured more than 500,000 social media posts. The Statista report comes in the wake of McDonald’s releasing its fourth-quarter results where the fast food giant beat estimates with regards to earnings and sales. Globally same-store sales recorded a growth rate of 5.5% which was the fastest pace of growth in six years. Wall Street had been expecting same-store sales to grow at a rate of 4.9%. Revenue however fell by 11% year-over-year and this was attributed to the fact that the fast food chain sold some of the restaurants owned by the company to franchisees. 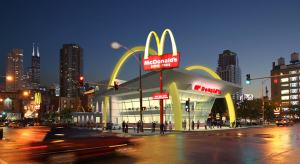 Currently McDonalds is 92% franchised compared to three years ago when the fast food chain was 81% franchised.